The fourth World Expo to be organised in Paris was held between 5 May and 31 October. Its area, number of visitors and profit of 8 million francs beat all previous records. The idea to host a Fair to celebrate the Revolution and the end of monarchy emerged as soon as the Fair of 1878 ended and preparations started in 1884. However, during the Expo, many celebrations were specifically held outside the Expo site, like in Versailles, in order no to turn the Fair into a political event. However, this initiative didn't convince neighboring monarchies to participate, though some of them did unofficially send industry representatives to the Fair so as not to miss out on economic opportunities. Two aspects of France were reflected in the Expo: social France and military France. On the one hand, the importance of education was stressed in the Champs de Mars and the Liberal Arts Palace, and a "social peace" section gave great importance to the status of workers who were very present in the Expo. On the other hand the Ministry of War showcased its souvenirs on the Invalides Esplanade, and the colonial exhibition was a great success. Iron architecture dominated the Fair and the Palace of Machines was no exception. Located on the Champs de Mars, it was so big that it occupied the whole surface of the park. Designed by the architect Ferdinand Dutert, the Palace was characterized by its huge and only arch. Inside, visitors could discover series of innovations such as atmospheric hammers, voting machines by Dayex, cigarette makers, Tissot's clock-making workshop, as well as phonographs and telephones. Reused during Expo 1900, the Palace was destroyed in 1910. At a time when iron was much used, Gustave Eiffel's company, which was specialized in metal buildings, was renowned for the viaduct of Garabit (France) and Maria Pia (Portugal). The project of building a tower was a dream for many engineers and Eiffel worked on it as soon as 1884. 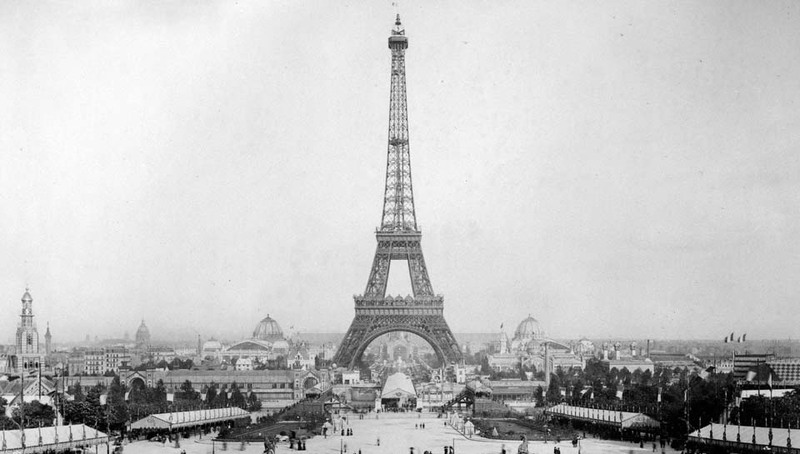 A competition for a 300 metre-high tower was officially launched in 1886, but it was quite symbolical as it matched Eiffel's project who won the competition. The project was very criticised, in particular because of the use of metal as an architectural feature and not simply as the building structure. The "Artist's protest" for example expressed its indignation towards this project that would distort Paris. However, after the hard work of 150 workers every day during 26 months, the 300.65 meter-high tower became the biggest success of the Fair. Visitors paid 5 francs to go to the top, either by elevator or by stairs, and the 7 million francs invested in its construction were paid off. The closing of the Expo was launched by shooting a canon from the top. During the 20 years that followed, the Eiffel Tower Company benefitted the right to use the tower, which was then given over to the city of Paris. According to some, the tower was never meant to be destroyed. According to others, Eiffel fought hard to stop it from being demolished by proving its technical and scientific use by installing, for example, an antenna in 1909.